A few weeks ago it was the downstairs of the DC Design House Bare Bones tour - now for the upstairs where it's still all about fresh color. C2 paints, one of the Design House sponsors, is creating a fun pet hang-out as part of their transformation of the back stairs. Love the planned mix of patterns. Designer Nancy Colbert of Design Partners has a pretty master bedroom planned with pops of juicy orange, including in this beautiful abstract painting. Dennese Guadeloupe-Rojas of Interiors by Design and Diane Taitt of DeSpace Designs are joining forces for the Master Sitting Room. Check out the planned pattern for the ceiling - it's designed to be removable. Fresh, pretty colors and details will be featured in the guest room of Susan Donelson and Sharon Bubenhofer of Cleveland Hall Design. Here's the 3rd floor bathroom before. The original tile is absolutely stunning in my book and I think, not sure, it is a part of the vibrant, new design that Anne Wenzel has planned. Melissa McLay has a fun, chic design ready for the third floor guest room that features a fabric by Annapolis based Victoria Larson. Now for this not so nice bathroom that lost its vintage beauty after a few bad attempts at upgrading over the decades. To the rescue is TJ Monahan of ibby - a division of Case/Design Remodeling. TJ is an architect who knows the challenges of cost-effective, bathroom remodeling with houses built during various decades. 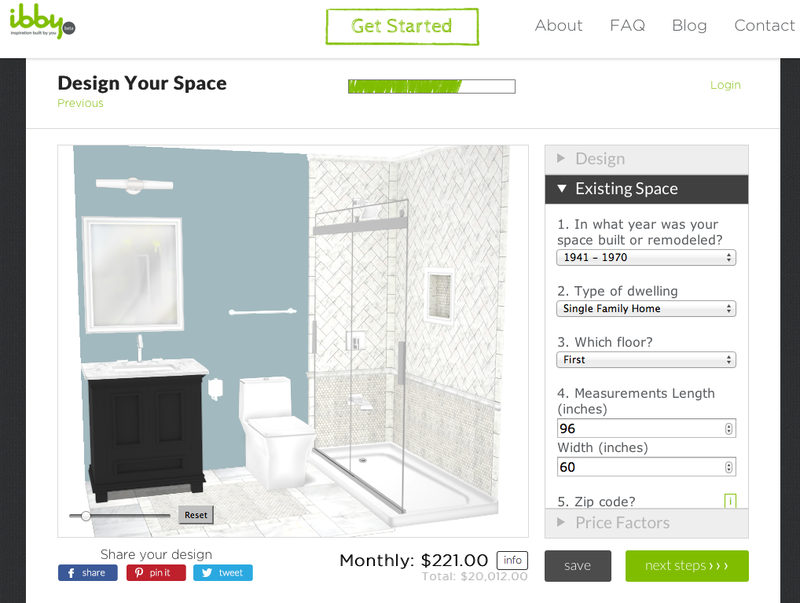 He's created an amazing service that lets you design and price your bathroom remodel using custom software that gives a cost estimate as you add in elements. One of the interesting features is that you choose when your home was built, which lets them factor in the type of remodeling you'll need. After you design it, you can order free samples, buy the design, or schedule a consultation to have the space built. I had a little fun with it myself and converted my 1954 hall bath to have a walk-in shower. Finally, Chad Allen will be taking this tiny, former sewing room and creating an office with fabulous pieces and interesting lines. Case in point, this amazing bookshelf. So, that's just a few of the spaces planned for the second and third levels of the DC Design House, April 13 - May 11. All the info here. ALSO - If you're a Polyvore fan there's only four more days left to enter The Pink Pagoda's Project Decorate contest for a chance to win a $500 gift card to Horchow. What a beautiful home with great bones. I especially love the plans for the hallway, the guest bedroom and the bathrooms. How I wish I could see it in person! Thanks for the previews, Michele. Really excited to see so many new (to me) designers participating. Still so upset that I'm going to miss this. Cannot wait ti see that bathroom witWhat looks like Manuel Canovas fabric!! THe whole house looks like it will be so fun! This was a great post! It's so much fun to see how it all happens. I hope you post more updates along the way. (It's so strange for me to see snow out the window, as it's been 80 degrees here)! That fabric in the Anne Wenzel design board is TO DIE FOR!! Is it Manuel Canovas? Is that to the trade only? Anyone care to guesstimate how much it costs? Can't wait to see this room when it's finished . . . . It's going to be amazing and can't wait to see the rooms become a reality. Happy weekend! Drooling over the window, and I am with you on the tile. Hope they leave it there. I can't wait to see the finished home! Every single board is gorgeous. I want to see all of this implemented!! I'm going to have to try that software. I have two baths I'm interested in remodeling. Thank you for mentioning my contest and for creating the fantastic entries! I want to attend. Do you ever feel like the timing in your life is never right?